Out of our comfort zone. Join us at Justascrappin' weekly Challenge to make a Non traditional Christmas card, layout or 3D project (thanks to one of talented designers' for this idea). You can use any colors but red or green. I love purple so that's what I used. 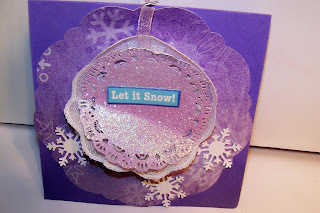 Starting with a purple card base at 5 1/2" I then used the Cricut cartridge Art Philosophy to cut the <circle4> at 4 1/2" and <FlurDels> at 3". Placed the circle onto the base, with a jumbo Zot in the Flur back I gathered the lace around it. 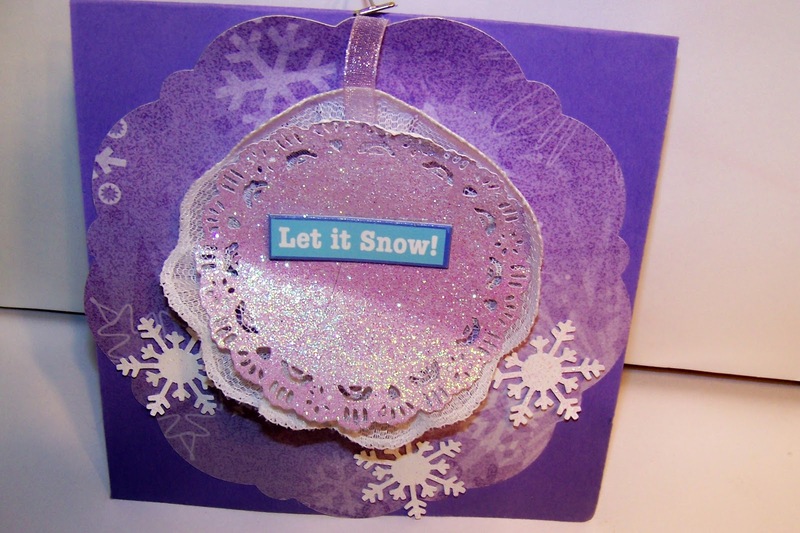 Using a sheer ribbon I hung the layer from the top of the circle like an ornament. 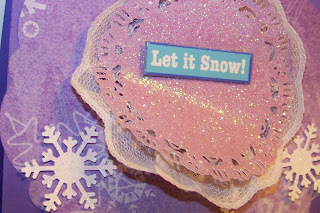 Last the "Let it Snow" sentiment and snow flasks to go with the pp in the circle. Join us at Justascrappin' weekly Challenge! I LOVE purple too! Great take on the challenge! Thanks for joining us at Just a Scrappin!